FREE 3 years legal expense cover! Part Exchange VERY Welcome, HPI Clear, All Bikes Come With Full Warranty & PDI, Carefully Prepared By Time Served Experts, The Caponard Is A Great Adventure Bike - With The Heart Of A Lion. The V Twin Power Gives A Class Leading Edge & This Thing Has To Be Ridden To Be Believed. Comfort Fun & Spec! Awesome Bikes! This Bright Example Also Has Fitted Panniers & Topbox And A Touring Screen! Nationwide Delivery From £120 + VAT. More High Resolution Images On Request, Buy 24/7 by TEXT On 07970 777639 - Low Rate Finance From ZERO Deposit, 60 Day Payment Holiday With All Standard HP Deals On Moto Novo. Typical Finance Example, £999 DEPOSIT Then 48 X £130.09 Total Payable £7392.32 Inc.Deposit, Flat Rate 5.5 % APR 12.5 % Representative Finance Is For Over 18'S Only, Available STS, Terms Conditions Apply. 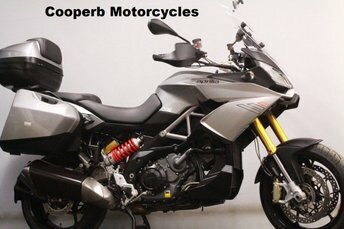 Get the best deal on a used Aprilia Caponord bike for sale in Northampton by making your way to Cooperb Motorcycles Ltd today. You will find every available model listed here on the website, and as all our stock is competitively priced you should have no problem sourcing a pre-owned Aprilia to suit your budget. Take the opportunity to browse our current range online before contacting a member of the showroom team to find out more. Our friendly and knowledgeable staff will be more than happy to answer any questions and provide advice and guidance when necessary. Alternatively, why not pay a visit to our showroom in person and take a closer look at the selection of used Aprilia Caponord bike models for sale.